Now that the holidays are well behind you, it’s time to get the family’s eating habits back on track. But those holiday eating habits can be hard to go cold turkey on. Going from a couple of months of feasting to what feels like deprivation is sure to spark a household rebellion, but there are steps to get you and your clan back into healthy eating habits. You’ve probably heard that often when you feel tired or hungry, you’re really just thirsty. Don’t worry too much about that whole 8 glasses of water a day thing. We all need different amounts of H20 depending on your salt intake, energy levels, body size, and activity levels. The trick is to start your day with a big jug of water, and then carry on drinking every hour, even if it’s not a completely full glass. Include plenty of water-laden foods to your diet, too, like salads, smoothies, and soups. If you’re not the biggest fan of plain water, add a squeeze of lemon for flavor. I know how unbalanced holiday eating can be. That’s because I know my body can handle temporary shifts in eating habits. I don’t need to eat perfectly balanced meals every single day. I also know that when my body needs something, like nutrient-rich vegetables, it tells me. Balance is really helpful, though, for stabilizing appetite hormones and sugar levels. And it works wonders for restoring balance to your body. Think about which foods have featured heavily in your life lately. Now, which ones have you neglected? It’s time to play around with proportions. When I talk about balance, I’m not talking about eliminating things. You can absolutely have a balanced and healthy diet that includes the occasional treat. Plan your meals to include tons of veggies. They’re super-high in nutrition and fiber and will keep you full without loading on calories. For example, if you chow down on 100 calories of broccoli, you’re going to be far more satisfied than if you ate a holiday cookie worth 100 calories. Maybe try to fill half the plate with vegetables. 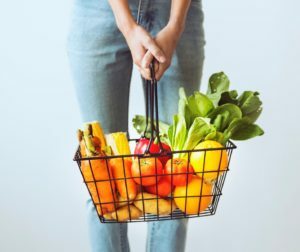 To help get you back to eating healthy, there are 3 things you need to consider cutting back on, mostly because they zap your energy and disrupt your weight goals. They are sugar, oil, and salt. Let me just say this; natural sugars from vegetables, fruits, nuts, seeds, legumes, and grains are perfectly fine. Those are all plant-based foods. Many foods include refined sugars like white sugar, dextrose, and corn syrup. Sugar ages you. It adds weight. It ups your food cravings, and it plays havoc with your blood sugar levels. Stop wasting your energy on added and incomplete whole food sources of sugar and rather add whole foods to your eating habits now. As for oil, or rather fats, get those from whole foods, too, like olives, coconut, seeds, nuts, and avocados. Skip the processed and refined stuff. Salt, or sodium, is something else you might want to cut back on. Excess sodium brings on the cravings, spikes your blood pressure, and makes you retain water. Sodium generally occurs in all foods so it’s not necessary to add more salt to your food, especially with so many delicious natural flavoring and herb options out there. Interestingly, many essential options like sauerkraut, almond milk, and mustard all have sodium to some degree, so there’s no need to reach for the salt shaker. In fact, get rid of it! Staying on track after the holidays is about repetition. Your success to eating healthier hinges on your ability to brush yourself off and get back on the healthier eating wagon. If it helps, make use of a food log, a diet tracker, or even have a couple of visits with a nutritionist who will create a healthier eating plan for you and your family’s needs. The smell of pumpkin pie may still be lingering, but it’s time to get back on track! Find more healthy living tips at marksalinas.com. No user commented in " Getting Back to Eating Healthy "